I have been sorting. I have been chucking. It’s been the recurring theme over the last eighteen months. I cleared my mother’s garage, I moved house, I emptied The Poetry Trust’s office. I published my first full collection. Sorting, chucking. And clearing. The garage had been a backdrop to my childhood. My sisters and I marked our heights on its walls and on the other side, in the garden, I played football against it. But it had long become a place to dump things and my eighty year-old mother was now worried it was going to fall down in one of those gales. It was also an asbestos garage too. Yes, asbestos. That meant it cost £800 to remove and needed men in masks and white ‘outbreak’ suits to come and carefully deconstruct a garage I had lived and breathed for forty-five years. But first we had to empty it. The clearance operation was led by my brother-in-law, Tony. Family ‘relics’ (or rubbish) from the last century were carried and hefted into the yard – a melamine writing bureau, a couple of old bikes, my sister’s hand-made clay pots from school (which Tony accidentally dropped), the dregs of every tin of paint we had bought for the last forty years, ancient carpets and lino, half a kitchen cabinet, a couple of science experiments in glass milk bottles and a plastic bag of sand. But there was a special present, at the back of the garage, just for me. My go-kart. When I saw it, after the intial surprise, I couldn’t quite believe that it hadn’t been thrown out already. That it was up to me to throw it out now, or not. I felt cheated. I didn’t want the decision. You see, I didn’t really want it. And I have no children to handily pass the thing onto. There was certainly no room in my shed to put it. I mean, I hadn’t thought about the thing for years. It would have to go. Wouldn’t it? At that time it was also becoming obvious that I needed to move house. I was stuck in a rut, I had lived there for nearly fifteen years and outgrown the space. I simply had too much stuff and no way of sorting it – mainly books and piles of papers and poems and more stuff on top that. A fresh start and moving was the only way. So in January 2015 I moved – admittedly not far, just down the street from number three to number fifty. And I took the opportunity to sort and chuck and clear my accumulated ‘stuff’ as part of the move. I even treated myself to new specially built bookcases in my new home, where all my books would be housed in one place. And by spring I had finally sorted out my books into an organised library and I relished the thought that I wouldn’t have to do it again for years, if ever. Last summer I also finally decided to move on from The Poetry Trust. I had worked for TPT and the Aldeburgh Poetry Festival for too long, since 1999, in many roles including Fringe Co-ordinator, Director’s Assistant, Artists & Projects Manager, Projects & Artists Manager, and finally, as Creative Director. I had the time of my life working with Naomi Jaffa and Michael Laskey – we’d given it all our energy and ideas, we had taken the Festival to new heights in the bigger state-of-the-art venues at Snape and the audience had come with us and grown too. It was brilliant artistically and had always managed financially. But fresh impetus was needed. In early 2015 Naomi left and Michael stepped down from his Festival roles. I’d committed to helping the new Director settle in for at least the first year but by the summer I knew this would be my last Festival. I certainly did not anticipate that my leaving would coincide with the organisation effectively closing down with the rest of the TPT team out of a job. And I hadn’t expected to spend my last two months clearing TPT’s office at The Cut where we had worked since 2003. Loads of carrying boxes down seven flights of stairs and trips to the dump. Furniture too. Then there was TPT’s library of over two thousand books of poetry, carefully packed into boxes in alphabetical order before they were eventually delivered – by me – to The Hurst Arvon Centre in Shropshire at the beginning of February. The work always did continue long after the audience left. Early last year, between the chucking and sorting, I finally got the news that my first collection was to be published by The Rialto. The working title became its final name, The Swan Machine. I sent the editor, Michael Mackmin, all the poems I thought might be included. It was a difficult process. I had to say goodbye to poems that had served me well over the years – those early ones from my first two pamphlets – Irresistible to Women (2003) and Just Our Luck (2008) – poems that had been loyal companions, read and re-read. We had history, me and those poems. They were like old friends. But many were poems which, to be honest, weren’t me any more. Then we loaded up the car, packed the go-kart on board and drove to the dump (the first of many trips). ‘I’m doing the right thing, aren’t I?’ I asked my brother-in-law. ‘Yeah, you don’t want it, do you? You’re never going to go for a peddle down the hill on it?’ We parked up at the dump and Tony and I took one end each and carried the kart to the scrap metal bay. Then with a ‘One…two…three’ we swung it through the window. Back in the car, putting on our seat-belts, Tony said, ‘Are you sure you don’t want it?’ looked at me for a second and then laughed. When we got home I checked my Facebook page on my phone. My posts usually get six ‘likes’ and a comment, if I’m lucky. The picture of the go-kart had got over fifty-six thumb-ups and twelve comments. One had said ‘Ah, I hope you took it home with you.’ and that night I felt terrible. I still have twinges. Of course, I had to write a go-kart poem. In some ways it became the pivotal poem of my first collection, kept it up to date, told where I am at in my life now. The book contains poems written over a twenty year period. It had nearly been published quite a few times over the last ten years and was almost accepted by at least three publishers. It was disheartening but it was too late to stop. And of course it would have been a very different collection had it been published earlier, containing younger man’s poems and not such a lifespan. I like to think it’s better for it. And so where are we now? My mother has a new shed where the garage once stood. The books are sorted. My poems are collected. And the go-kart, I still have somewhere, although it takes up a lot less space. it was, with black taped stripes. and I try to wipe away the dust. into the stiff rusted pedals. Dean Parkin was born in 1969 in East Suffolk where he still lives. He left school at 16, worked at a printer’s, then in a bookshop and as an independent publisher of local history books. 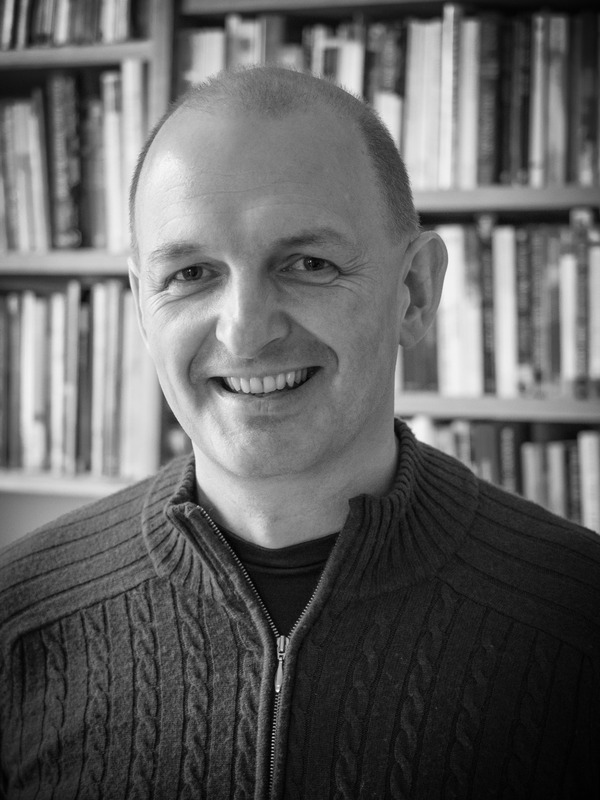 From 1999 he worked for The Poetry Trust – latterly as Creative Director, programming the Aldeburgh Poetry Festival – until he stepped down in the autumn of 2015 to focus on his work as a freelance poet. He’s an experienced workshop leader and runs sessions for every age group – from primary school children to the over nineties. He has published four pamphlets. The Swan Machine (The Rialto) is his first full collection. I love this post, and I love the poem. And I’m wondering if writing about things I don’t but am sentimentally attached to – and then throwing them away – is my solution too. 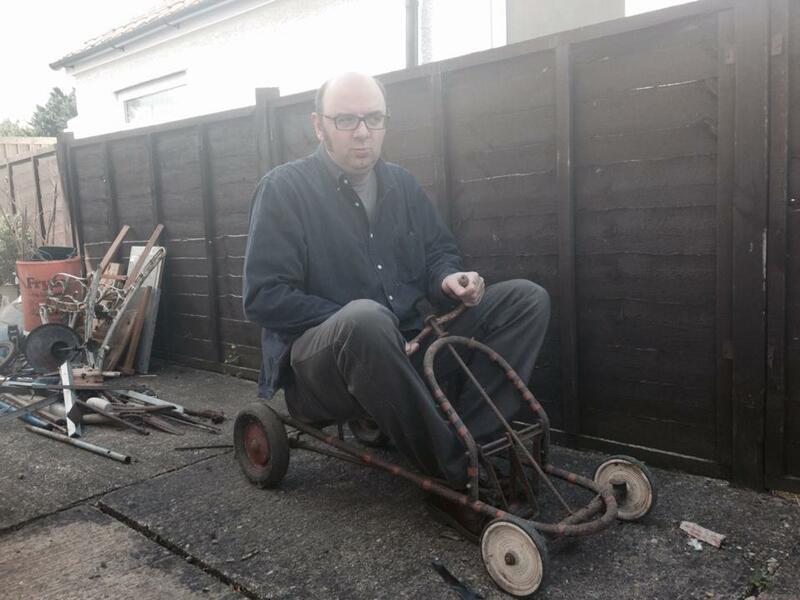 I enjoyed the idea of the go-kart, but I am mainly drawn in by the idea of sorting, chucking, emptying. I have many stacks of poetry, both mine and that of others, files, papers of all kinds, mail, books, office supplies, and more. All of it needs to be organized. As I said in one of my blog posts, I wait for the personal assistant who appears at the door with magical powers for filing, sorting, and organizing. Congratulations on all your hard work, Dean. This made my day. Nostalgic and thoroughly warming. Cleaning out and starting over is a difficult transition. But writing about seems like a great way to make it a little easier. Thank you.